Read online ""Hath God forgotten to be gracious." 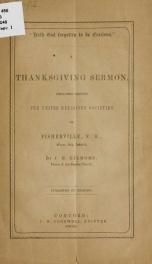 A thanksgiving sermon, preached before the united religious societies of Fisherville, N.H., Nov. 26, 1863 1" by YA Pamphlet Collection (Library of Congress) DLC. Instant free e-book download at OnRead.com.